I have a 2015 Isuzu. I wasn't happy with the old map that is installed in the in dash GPS. Isuzu told me they would have a new updated map available in 2016. I had the truck serviced a few days ago and paid for the update. It was 200 baht. Available the first week of May. I hope that will improve the GPS. As it is now, my cheap Garmin is MUCH better. Got a 2015 Mitsubishi Triton which has free GPS updates downloaded from the Navi webite to the SD card that is inserted into the unit. Some locations are in Thai and others in English. Good luck figuring out which one is in English. One misspelled transliterated word and you're lost. I also have toyota GPS and informations are very old-may be 10 years ago. In the garage they said: we don't know how to update! I try to contact call Toyota center without answer. I have a 2015 Isuzu and although the in dash unit gets you where you want to go, the little Garmin on dash unit does a far better job with many more roads and points of interest. An Isuzu map update was supposed to be free and it was almost free. It cost me 200 baht. It is better, but the cheap Garmin is still better and easier to use. If you have a choice don't waste big money for an in dash unit. I own a Toyota Hilux Vigo 'G' 2014 model which includes a dash fitted Navigation unit. To update the map, the ONLY way this can be done is to purchase a new Toyota supplied SD card to include new map data. If you bought one today (time of writing is 20th June 2017), it will cost you B20,955 and the database is dated 2015. 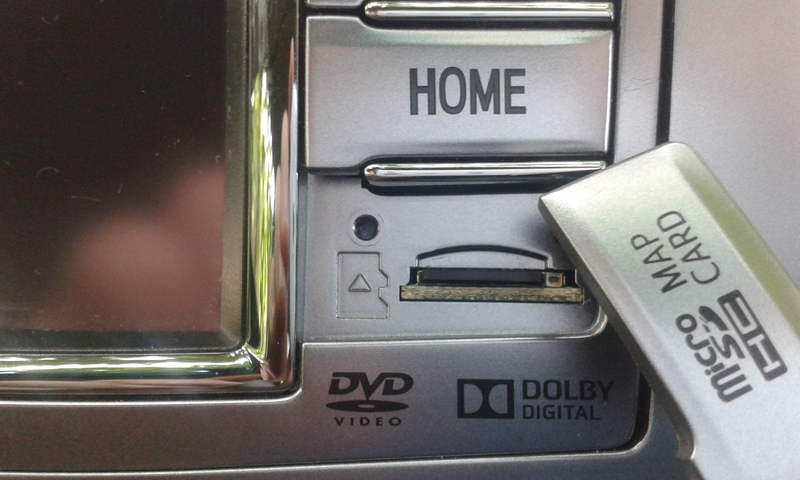 WARNING: If you think you can simply remove the mini SD card (located in the right hand bottom corner of the dash unit - see photo below) and then try downloading a new map system from the internet - BE WARNED. Firstly, it doesn't work and secondly it wipes the existing map database clean. How do I know this? I tried and failed to my cost. I'm writing this message impressing upon you not to go through the same heartache I've just experienced. 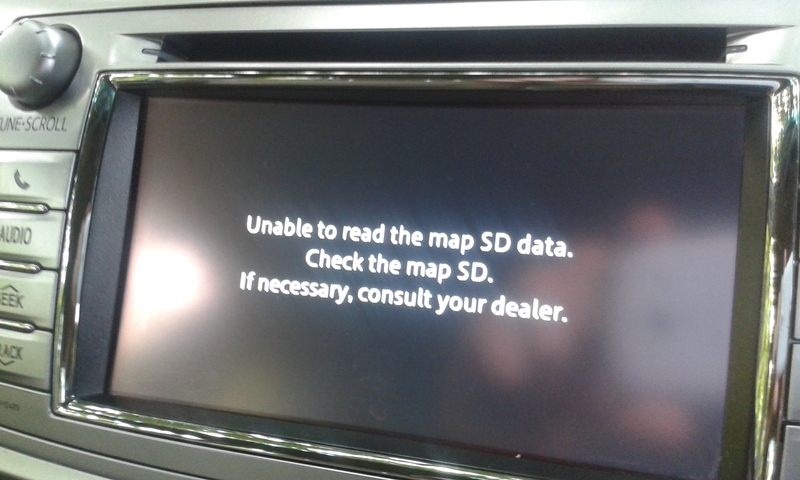 Anyway, if you do try and attach the mini SD card to a computer, and/or a phone, as soon as you connect to the computer that SD card is wiped clean and as a result, when you refit your SD card into the unit, you will see a warning message on the screen asking you to visit your local Toyota dealer - see photo below. Additionally, two other functions no longer work: 1) the radio, CD and USB screen display, and 2) your bluetooth phone function does not function. I must now either replace the SD card with a one and a half year old map database at a cost of B20,955 or purchase a non genuine dash unit at a cost of between B8,000 and B12,000. I know which option I will chose, because when I come to resell my vehicle, if that dash unit isn't working, you can kiss goodbye to B20,955 off the value of your vehicle! I too am not impressed with Toyota Thailand, especially their head office customer care staff who whilst listen to what you have to say - don't actually care at all. If they did care, they'd make this an affordable update during dealer visits. Toyota is thus prepared to have unhappy customers and miss an important incremental profit opportunity and so as far as I am concerned, their short-sightedness is at their greater cost. Isuzu works about the same way. I got the first update for 200 baht because the original map was probably four or five years old and I irritated the dealer by complaining a lot. Even with the new map, It is still not as good as my 4,000 baht Garmin. The dealer did warn me that if I removed the memory card, everything would be lost. Needless to say that I have not removed the card. I will never order another in dash unit. There does not appear to be a time limit on the updates - just updated my neighbour's 5 year old tuna. I think that whether or not you can update the maps in your in dash unit depends on who built the unit. I doubt the vehicle manufacturer would like the customer being able to bypass the dealer and update the unit by themselves. This is about money and the dealer wants to make money. Are there any Android based dash units out there? Just used my old mobile with a dash mount off Lazada to tour around Thailand for a month and Google Maps directions were superb, rerouting me when there was traffic around Bangkok and very rarely making any mistake. Connection with CAT 3G - 99B/month for unlimited 384kbps, plenty for Google to connect with servers and feedback on traffic ahead. Having this built in would be the best solution, with Google Maps being as up to date as anything, with added live traffic information. There are no Android-based dashboard units, as far as I know. Tesla currently uses Google Maps, I believe, but I read recently that they are developing their own maps now for future use with their "autopilot" system. The Fortuner is equipped with a unit made by Garmin, as are most - but not all - GPS units in vehicles. All Garmin units can be updated as described above. This is not a matter of dealer choice, but sim[ple the way Garmin builds their software. If you have an in-dash GPS, try it. Apparently my Isuzu indash GPS is made by Clarion. It uses a map called iGo which leaves a lot to be desired. I did receive a mapupdate and it is better but not as good as my cheap on dash Garmin. Before the update I contacted both iGo and Clarion. Both had the same story. I have to work with Isuzu because the map and unit are proprietary. I offered to pay iGo for the latest update and was told that is impossible because Isuzu has the codes. Android car DVD units sold on Aliexpress. If your lucky on having a car model supported. I guess retro fitting can be done. I got mine for vios 2003 in oz. Recommended. Just get a higher spec one. 2gb ram. Oreo. consider tax charge if ordering from ali.